This incredible series guide, common core designed, was created by Mary Blow, sixth grade teacher at Lowville academy in Lowville, NY. Mary is a Scholastic Mentor Teacher and also my admired friend. I’m so lucky, because many teachers are using my books in their classrooms. Here you’ll find robust support for using my books. 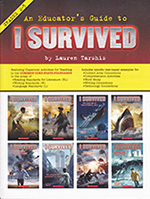 Big thanks to Julie Leonard, an amazing fourth grade teacher from Fredericksburg, VA, who created all of the I Survived resources!